Showing 36 articles from July 19, 2017. LOUISBURG -- The Franklin County Board of Commissioners approved an ordinance this week that opens the floodgates for development. Last August, an engineering company performed a water/sewer allocation study for Franklin County, concluding that about 90 percent of the county's water supply is either being used or has already been allocated. 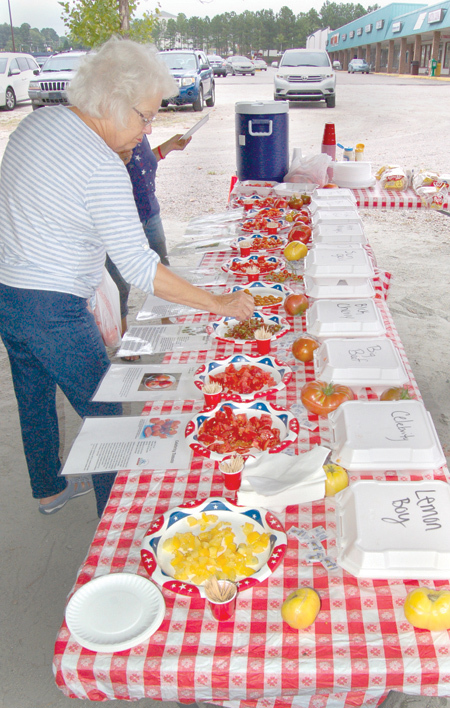 Mary Mac Lucas samples some of the many varieties of tomatoes that were available at the Franklin County Farmers' Market in Louisburg as part of Tomato Tasting Day, hosted by the Franklin County Cooperative Extension. Guests were able to sample the locally grown produce and make sandwiches, as well. LOUISBURG -- The town now has a strategic, long-range plan aimed at fostering downtown revitalization, business development and the community. The plan, which was developed by a local Steering Committee, was unanimously approved by the town council Monday night. The committee first created a vision statement that states: Louisburg is a peaceful, historic, southern small town with a proud past and a positive future fostered by community, faith and family." LOUISBURG -- The municipal filing deadline is Friday, but, already, Louisburg and Franklinton are assured political battles. Wake Forest voters will see a battle, too. In Franklinton, seats held by incumbents John Allers, Alvin Holden and Johnny Mitchell are up for election. Allers and Holden had both filed for reelection by press time. 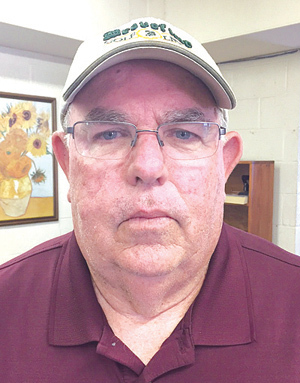 YOUNGSVILLE -- Youngsville hired its next town administrator. Following a closed session, commissioners agreed to enter into a contract with a governmental consulting agency -- N•FOCUS -- to provide them with town administrator duties. Roe O'Donnell, who retired as Wake Forest's deputy manager, will fill that role, expected to begin in September. 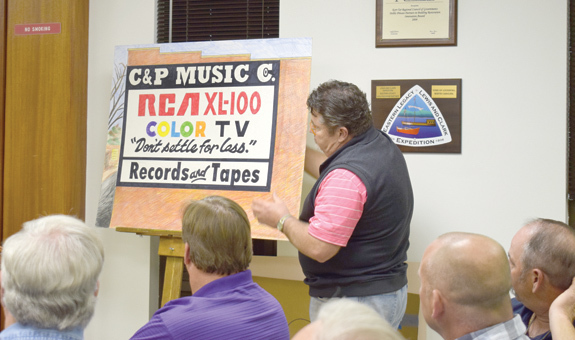 And that's what has happened this summer, thanks to Louisburg College Professor Will Hinton who took the lead on restoring the C&P Music Co. sign that has been a fixture on the side of a Nash Street building since 1973 or 1974. LOUISBURG -- Franklin County learned last week that it will lose its second in command. 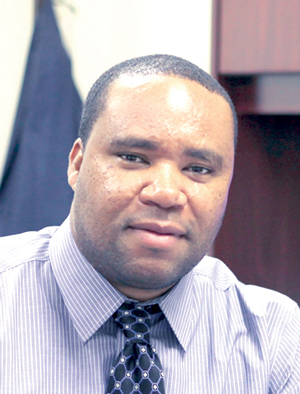 Assistant County Manager Elton Daniels resigned on July 14, announcing that his last day will be Aug. 25. He will take over as Selma's town manager on Aug. 28. "I've enjoyed my time here and I've learned a lot and met some wonderful citizens and fellow employees," Daniels said. After five shootings in a week, what's next? Five separate shooting incidents in seven days. One person dead. Two wounded. 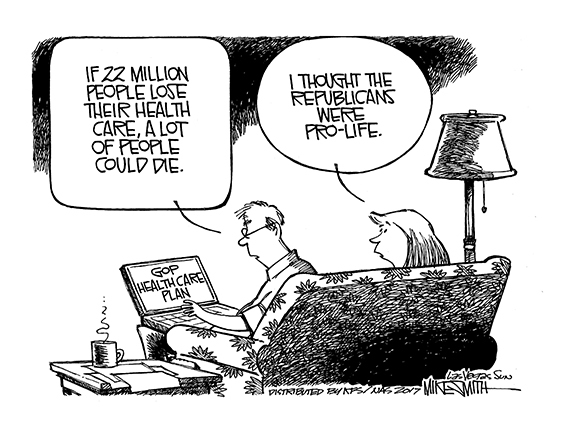 And a lot of folks are shaken up -- justifiably so! You might think we'd all be numb from reading about the frequent shootings in Durham, Fayetteville, Raleigh and even Chicago. But it's different when it's almost in your own backyard -- or at a restaurant on Bickett Boulevard! It would be great to have good news to report about the state's recent activities. But not this time. Sorry. 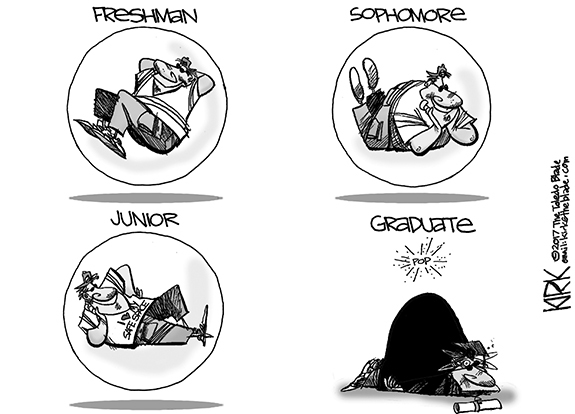 This editorial is not only about our state government, it's also about political shortcomings that adversely affect all of us -- and even future generations of Tar Heels. 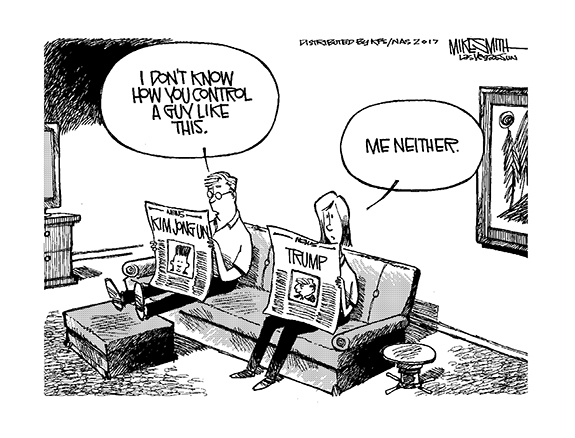 It seems that, nowadays, anyone can be president. Or, at least anyone wants to be president. Fresh off the election of President Donald Trump, who, to most people, was most recognizable for the strange confluence of hair upon his head, billions in the bank, suing the NFL and saying 'You're Fired,' a host of other celebrated human beings appear to have set their sights on politics. This message is to inform you about the deplorable conditions at the recycling site next to the Sheriff's Department. As you are aware, some time ago, the recycling site in Louisburg next to the Farmers' Market was closed and moved next to the Sheriff's Department. Whereas there were several containers at the Farmers' Market site, only one was placed at the present location. LOUISBURG - Born June 26, 1931 in Franklin County, she was the daughter of the late Quinton S. Leonard and Sallie W. Leonard. Betsy was a 1949 graduate of Mills High School. She attended Meredith College and received degrees from Atlantic Christian College (BA) and East Carolina University (MA). She married John C. Pernell in 1950 and they spent the next 61 years living on the Leonard Family Farm until his death in 2013. LOUISBURG - Betty Perry Horton, 75, of Louisburg, passed away July 18, 2017 at the William M. Dunlap Center for Caring. She was born in Wake County to the late James H. Perry and Euna Morris Perry Newton. 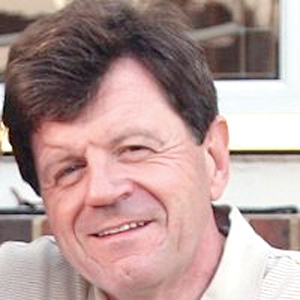 LOUISBURG-Thomas "Tommy" B. Reed, 65, of Inez Township, N.C., died at Duke Hospital on July 14, 2017 surrounded by loved ones. CATCH THIS. Louisburg All-Star catcher Machaiah Grissom tries to come up with a pop fly during last week's Tar Heel District 5 Coach-Pitch Softball Tournament at Carver Elementary School. 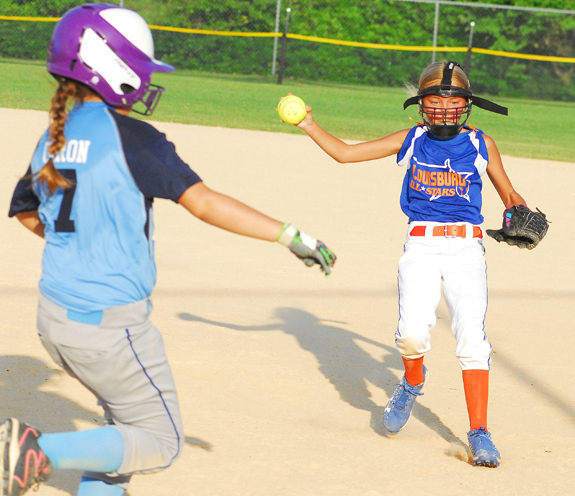 WENDELL -- Despite falling in the championship contest, all was not lost for the Louisburg All-Stars at last week's Tar Heel District 5 Girls Coach-Pitch Softball Tournament at Carver Elementary School in Wake County. 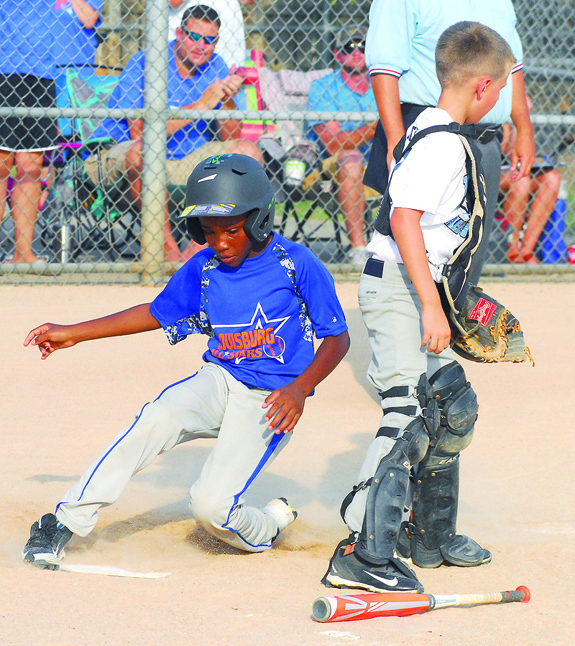 The All-Stars, coached by Deney Buchanan, were able to secure a second-place finish -- and that performance was good enough to earn a spot in this week's State Tournament at Smithfield Park. GONNA BE CLOSE. 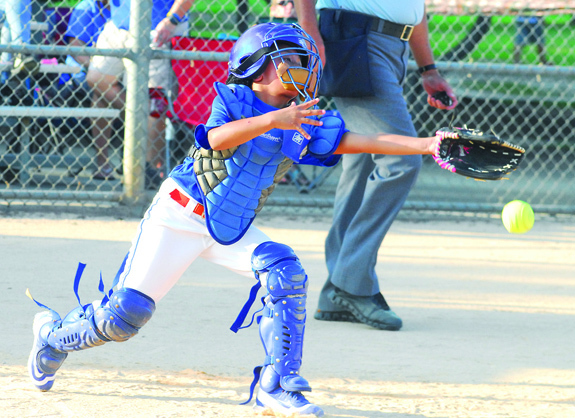 Wendell Blues baserunner Jayden Morales slides toward home plate as Louisburg catcher Mason Batton tries to come up with the ball during last Wednesday's tournament contest in Wendell. 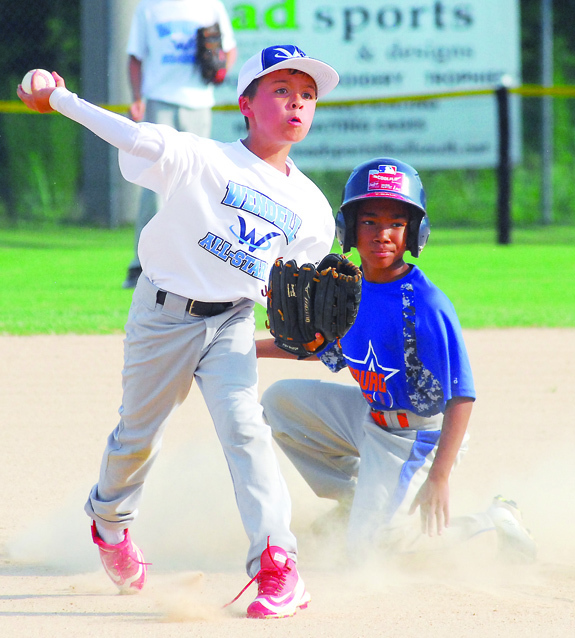 WENDELL -- More than just an area championship was at stake last week when Louisburg traveled to Wake County to take part in the annual Tar Heel District 5 Coach-Pitch Baseball Tournament. Members of the Louisburg roster didn't know that a Top-Three finish would guarantee the All-Stars a berth in next week's state tournament. But Louisburg coach Chad Champion knew, though he chose not to share that fact with his players. LET'S STICK TOGETHER. 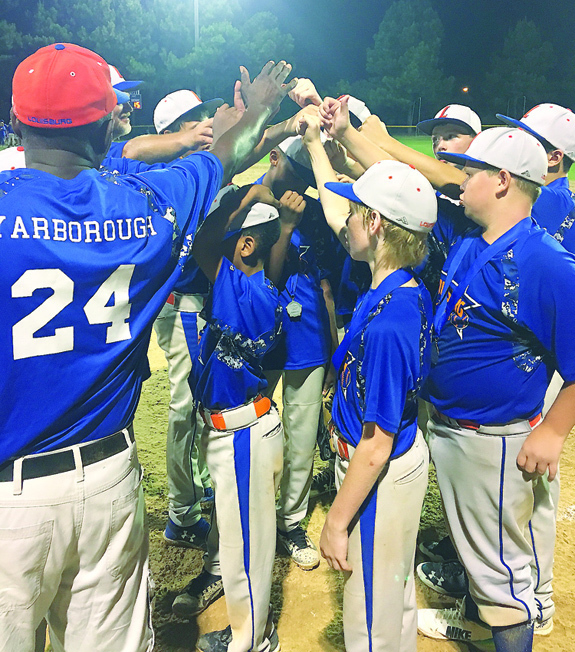 Members of the Louisburg All-Stars huddle up during last week's action at the Tar Heel District 5 12-Under Baseball Tournament. 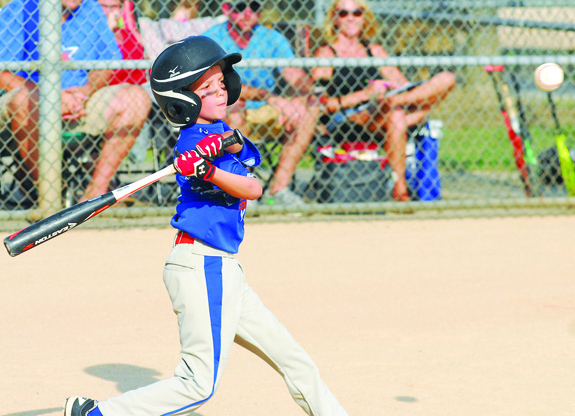 ZEBULON -- Louisburg ended up working overtime during its finale against Garner Baseball in the championship game of the Tar Heel District 5 12-Under Tournament at Zebulon Elementary School. Both clubs entered what was sure to be a hard-fought championship game with one loss apiece in the double-elimination format. That provided a winner-take-all element to the title contest, which featured a state tournament berth to the winner. LOUISBURG -- A long-time fixture in the Franklin County softball scene, J Stamey has continued to build the Louisburg Lady Warriors into a diamond powerhouse. 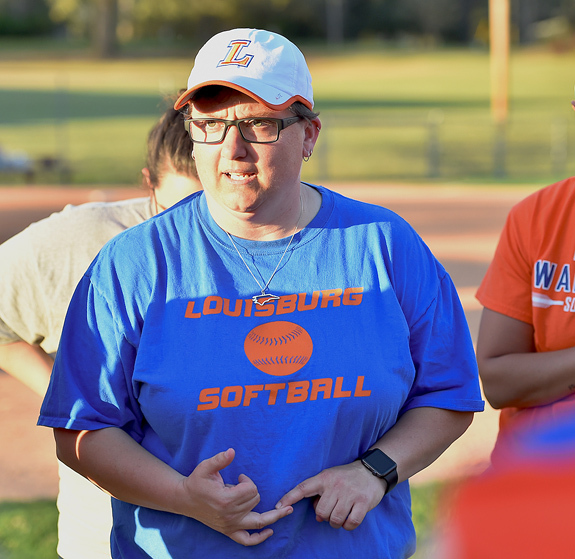 Stamey, a former player and assistant coach at Louisburg College, also served as an assistant at LHS before taking over as the head coach three years ago. Stamey, a Lincoln County native, has experienced nothing but success during the past trio of campaigns -- including a trip to the Final Four of the Class A State Playoffs this spring. FRANKLINTON -- Like many teenagers, Matthew Hockaday considered Lester Wilder to be a mentor when Hockaday was a student at Franklinton High School in the early 2000s. Little did Hockaday know that one day he would be blessed with the task of replacing the retiring Wilder as FHS' girls basketball coach. Wilder concluded his amazing career at Franklinton this past season, and Hockaday, a 2004 FHS graduated, has been announced as his replacement. LOUISBURG -- Louisburg College, coached by Martin Dell, will begin its 2017 men's soccer schedule with an appearance at the CCBC-Essex Tournament in Maryland on Aug. 26-27. LC will tangle with host CCBC-Essex on Aug. 26 at 4 p.m. before wrapping up event action one day later with a contest against Monroe College from New York. 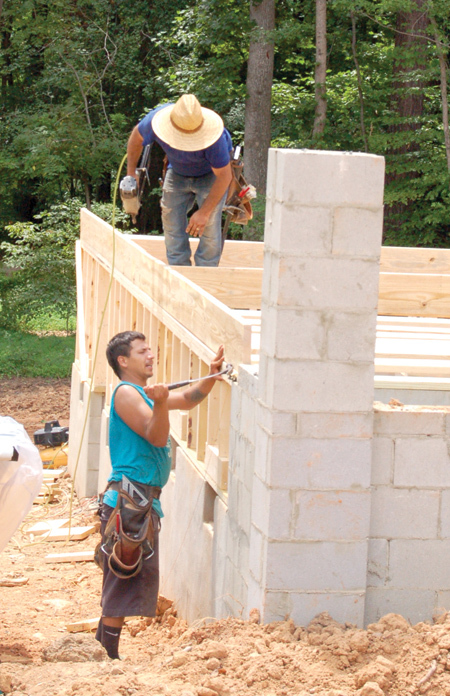 Louisburg's home opener will be Sept. 2 at 4 p.m. versus USC-Salkehatchie. SALEM, VA. -- Jordan Yamamoto allowed just one unearned run on seven hits over a season high seven innings pitched, but the Salem pitching tandem of Roniel Raudes and Logan Boyd combined on a five-hit shutout while defeating the Carolina Mudcats 1-0 on Tuesday in Salem in a Class A Carolina League baseball showdown. The loss came in the rubber contest of a three-game series and sealed a two games to one series loss for the Mudcats (48-46, 12-14). 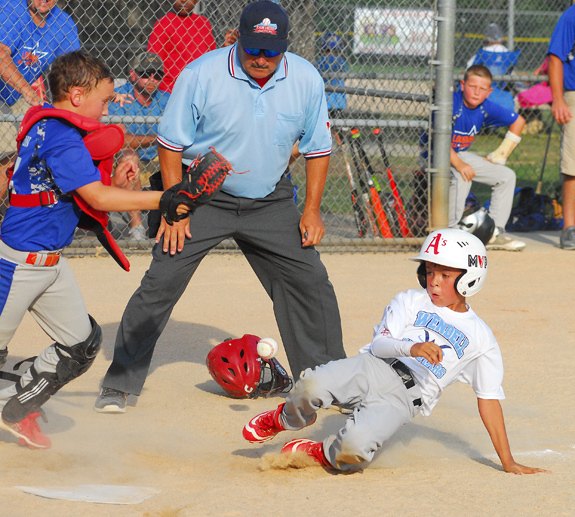 Jakobe Edgerton slides safely into home plate for the Louisburg All-Stars during last week's action at the Tar Heel District 5 Coach-Pitch Baseball Tournament at Carver Elementary School. 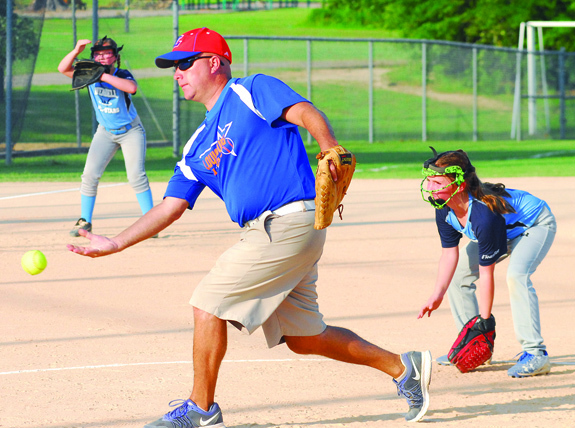 Louisburg All-Stars coach Deney Buchanan sends an offering toward home plate as Wendell players get into a defensive stance during last week's tournament action. Wendell's Jayden Morales (with ball) forces Louisburg's Travis Brown at second base. Bunn High School's D.J. 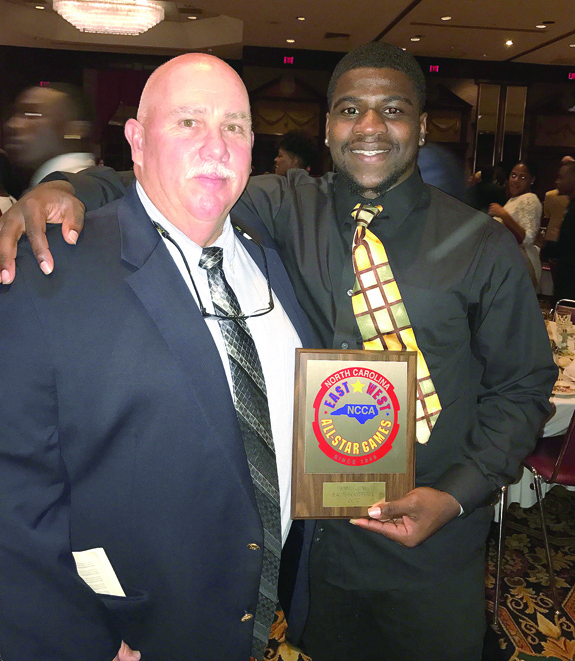 Jones (right) received a plaque last weekend during the annual East-West All-Star Games Banquet in Greensboro. Jones, who will continue his gridiron career at Fayetteville State, is joined in the photo by former BHS head coach David Howle. Jones competed in Wednesday's East-West football game at Jamieson Stadium. For more on the contest, see next week's edition of The Franklin Times. Louisburg's Maycey Buchanan (right) wins a footrace to first base to secure an out during last week's Tar Heel District 5 Coach-Pitch Softball Tournament at Carver Elementary. Louisburg All-Star Anderson Inscoe prepares to make contact during last Wednesday's meeting with Wendell Blue at the Tar Heel District 5 Coach-Pitch Tournament. 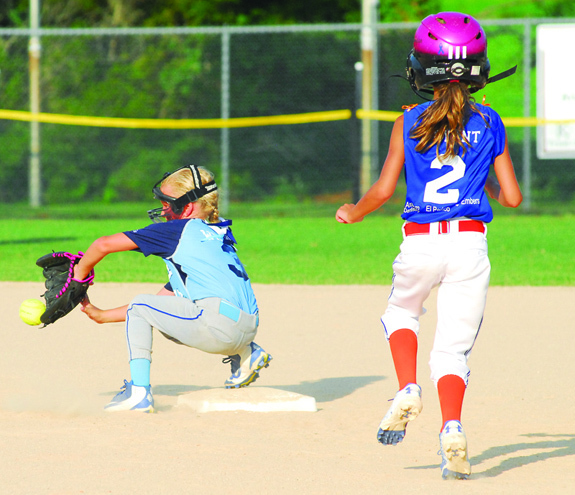 Louisburg's Kherington Bryant (right) is safe at second base as the ball gets away from a Wendell infielder during last Wednesday's action at the Tar Heel District 5 Girls Coach-Pitch Tournament at Carver Elementary School in Wendell. 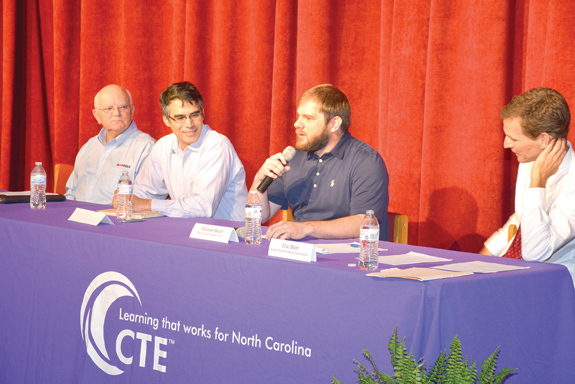 FRANKLINTON -- Educators, local industry representatives, community leaders and a recent Vance-Granville Community College graduate shared ideas at a recent panel discussion organized by the Advanced Manufacturing Skills Training Alliance (AMSTA), a partnership of VGCC, Franklin, Granville, Warren and Vance county schools. The event was part of "AMSTA Summer Cruisers 2017," a multi-day program that brought teachers from the four counties together to learn more about manufacturing and the regional economy. LOUISBURG -- After adopting its long-range strategic plan Monday night (see related story that begins on page 1A), the Louisburg Town Council tackled several rather routine items, some of which may have a long-term impact on the town. The council learned from Town Administrator Jonathan Franklin that Louisburg has received $250,000 in Downtown Revitalization funding in the new state budget. RALEIGH -- District Attorney Kimberly Robb has taken office as President of the North Carolina Conference of District Attorneys and the NC District Attorneys Association. Fellow prosecutors, including District 9 District Attorney Mike Waters, who's region covers Franklin County, elected Robb to the post at the association's summer meeting in Winston-Salem. With a snip of a ribbon, the Blue Collie Coffee Shop in downtown Louisburg was officially opened recently after an earlier "soft" opening. Cutting the ribbon was one of the owners, Paige Sayles, (center behind the bow) while her husband and co-owner, Dr. Al Sayles (just behind her and to her right in this photo) looked on. The shop, which hires special needs workers, offers a variety of coffee and coffee-related drinks, sandwiches and pastries. The shop is at 106 North Main Street, across the street and just south of the Post Office.